Every magazine is talking about a new diet seemingly every week. With all of this information everywhere, it’s so easy to find yourself completely lost. So how can you sift through all of this to find a plan that works for you? Fitness professionals dedicate their lives to cracking each individual’s weight loss code. Are You Successful Sandy or Troubled Tammy? As counterintuitive as it seems, a plan that works for one person can completely fail somebody else. For example, imagine two best friends: Successful Sandy and Troubled Tammy. Sandy and Tammy are dedicating the next 3 months to the paleo diet. Sandy attains normal results, losing about 1 pound each week, but Tammy fluctuates from week-to-week and, when all is said and done, doesn’t lose a pound. Sandy lost 12 pounds and feels amazing. Tammy lost 0 pounds and feels defeated. There are Tammys everywhere being deprived of the things they want most… real, sustained weight loss. The worst part of these diets failing is NOT the fact that Tammy hasn’t lost weight. Motivated people start these diets with the best of intentions and are lead to believe that simply going on a diet is what they need to fit into their old clothes. But after weeks/months of hard work (24 hours a day), they can’t figure out why something that worked for their friend left them with nothing. Worse yet, they’ve spent invaluable time and energy on spinning their wheels. Contrary to what most people think, the diet you choose is not the problem (and it might not matter AT ALL). Most people have a good idea of what it means to eat well. What they don’t know is how to fit that diet into their lives. Diets are everywhere, yet obesity is at an all-time high. This is your chance to forget the media hype and take back control of your life. What if you could make it easier to lose weight? A change that would shock your co-workers, inspire your family members, and get back at your old college boyfriend. If so, you’re in luck because I’ve combined my years of personal training experience and cutting-edge research on human behavior and weight loss into one simple program. When one of my clients is struggling with losing weight, I’ve noticed that the problem is almost always with compliance. It was the same problem I saw when I was teaching college students; how can I get them to do the work? Basically, when it comes to weight loss… I’ve discovered that the number one thing you should focus on is getting control of your behavior. Lance Goyke’s style is so ahead of the rest of the industry. It has been a real eye opener for me. He keeps your whole bodies health in mind while creating a sustainable workout. Because of his plan I am stronger and more flexible while balancing out my weaknesses. He is an outstanding master of his craft; incredibly bright and filled with mounds of health and fitness knowledge. He is the real deal in an industry full of wannabees and is the standard by which any trainer should be measured. Right now, if you’re like most people, you’re at a crossroad. …Or you can get control of your behavior and start losing weight today. The choice is your’s… and the decision is simple. Four months of written exercise programs. Done-for-you set and rep schemes, rest periods, speed and power exercises, core exercises, strength exercises, and conditioning protocols to make you happy when you look in the mirror, keep you from huffing and puffing whenever you take the stairs, and set a healthy example for your children. A warm up routine with specific flexibility and mobility exercises so that you can move more confidently and fight off those troublesome aches and pain. A logical progression from week-to-week & month-to-month so that you always know what steps to take next to make progress that is sustainable. Video exercise demonstrations of EVERY exercise linked directly in the program. How Can You Trust That This is the Program For You? Test drive the Willpower Workout for Weight Loss for the next 150 days. See for yourself how much progress you can make. 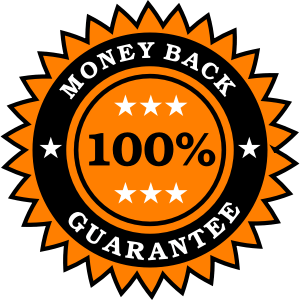 You are protected by my iron clad 100% money back guarantee. If you are not completely satisfied, you can simply send me a copy of the 4 months of programming you completed with your weights listed for each exercise and I will send you a full, 100% refund. 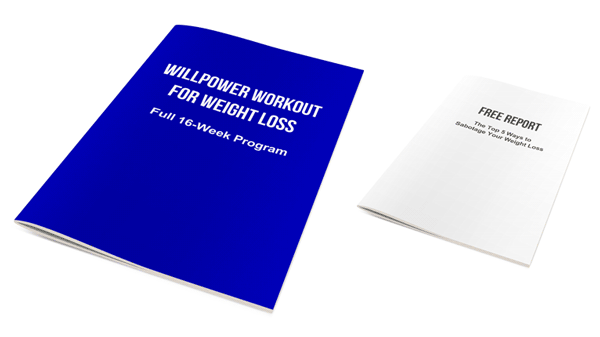 …Get the Willpower Workout for Weight Loss to get a clear and specific program you can start today. If you’d like to try out the first month at even lower risk, I’m going make it available for $1. Your health is never something to mess with. P.S. The Willpower Workout for Weight Loss is the number one way to take back your health. P.P.S. My mission is to give you all the tools you need to succeed. If you don’t feel I did, I’ll refund you the full purchase price. All I ask is that you give the program a shot. You have nothing to lose.